Happy feast of the Holy Guardian Angels! Today we have a great opportunity to help our children develop a deeper relationship, understanding and appreciation of angels. An angel is a pure spirit created by God. The English word “angel” comes from the Greek angelos, which means ‘messenger’. For more information about angels see my previous post Feast of the Holy Angels. My kids are super excited to have another tea party followed by crafts this afternoon. Each year for this special feast we have made lots of angels which we have used to decorate our home by hanging them off our dinning room light and displaying them on the wall. Last year the kids made three to four angels each. They made St. Michael, St. Raphael, St. Gabriel and an angel to represent their guardian angel. They used a sword with St. Michael and came up with other symbols to represent the different angels. 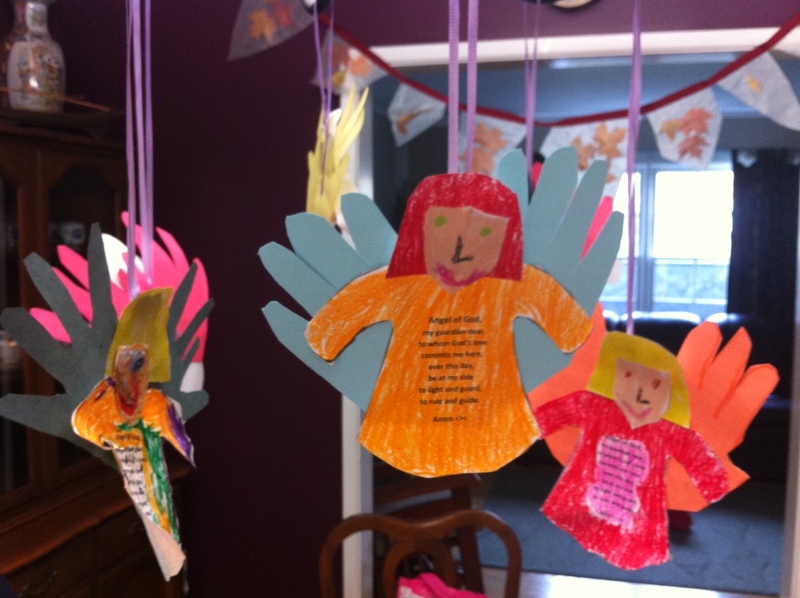 We then glued prayers onto some of the angels. 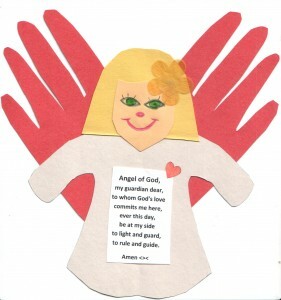 This craft is super easy to make and personalized as each child gets to trace and use their hands as the angels wings. The kids love tracing their hands hence why they each wanted to keep making more angels. I can’t think of a year when the kids only made one angel each. 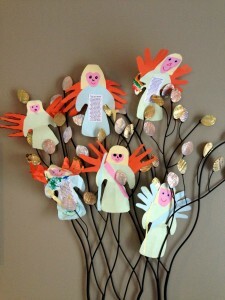 Here is my ANGEL Craft post with instructions. and thus find favor with God and redemption through Christ Our Lord. May we sing the praise of God our Savior with the angels and saints in heaven forever and ever. Amen.